Latino Art Now! Bulletin, February 2019. Daniel Anguilu, Art as Activism, 2015. Mural (Houston), spray paint on concrete. The Latino Art Now! Conference is the signature event of the Inter-University Program for Latino Research (IUPLR), a research consortium of twenty-six university-based institutes and centers dedicated to addressing the issues impacting Latinos. The University of Houston’s Center for Mexican American Studies is now the new headquarters of the IUPLR and Pamela Anne Quiroz serves as its executive director for the period of 2018-2022. One of two research conferences of the IUPLR, Latino Art Now! (LAN) explores and celebrates Latino/a/x and Latin American visual artists in the United States. First held in 2005, the LAN conference has evolved into the leading national forum for artists, art professionals, educators, scholars, critics, and art dealers to periodically explore the contours of Latino art, its future directions, and its relationship to contemporary American visual culture. As such, the conference seeks to advance understanding, awareness and education of the value of Latino art as integral to American art. For the first time in 2016 in Chicago, the conference launched a three-month-long celebration—The Spring of Latino Art, where more than sixty local museums, galleries, and cultural centers joined in presenting Latino art and artists by hosting citywide programming, exhibitions, and curatorial presentations. Maria Christina Jadick, The price of Oil How Many More? 2011-2018. 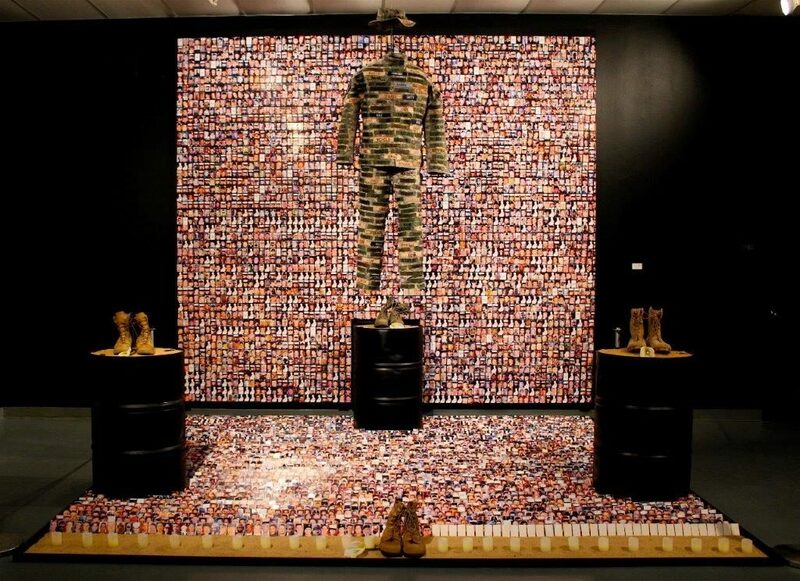 Mixed media, photos of soldiers, sand, oil drums, uniform name labels, candles, boots, wood frames, 11 x 12 x 11 ft. Greater Houston is now the fourth largest city and one of the most ethnically-diverse in the United States. This global city has seen an increase in its Hispanic population in the last decades fueled by local growth, migration from other parts of the country, and immigration from Latin America. It now boasts a 44.5 percent Hispanic population, mostly defined by its youth. In exploring its Hispanic visual arts heritage, Houston recently celebrated the restoration of one of its first contemporary public art murals. In 1972 Leopoldo Tanguma, with friends and students, painted the 240 x 18 foot iconic Rebirth of Our Nationality on the then Continental Can Company building at 5900 Canal Street. Expanding the full length of the facade, the mural became a recognized icon of public art in the East End and an inspiration for future artists who experienced it as children walking and driving by. One of them, GONZO247 (nom de can for Mario Figueroa, Jr.) would go on to work with the artist to restore the mural to its former glory in 2018. The 2019 LAN Conference Sight Lines and Time Frames held in early April in Houston–the fifth city to host such an effort, has also featured the second Spring of Latino Art as a four-month (February-May) citywide event of neighborhoods, museums, and galleries. With an array of visual art exhibitions, public art installations, theater plays, ballet performances, poetry and literary readings, artists lectures and talks, and book and film festivals, among others, the celebration attests to a lively and vibrant contemporary art scene. 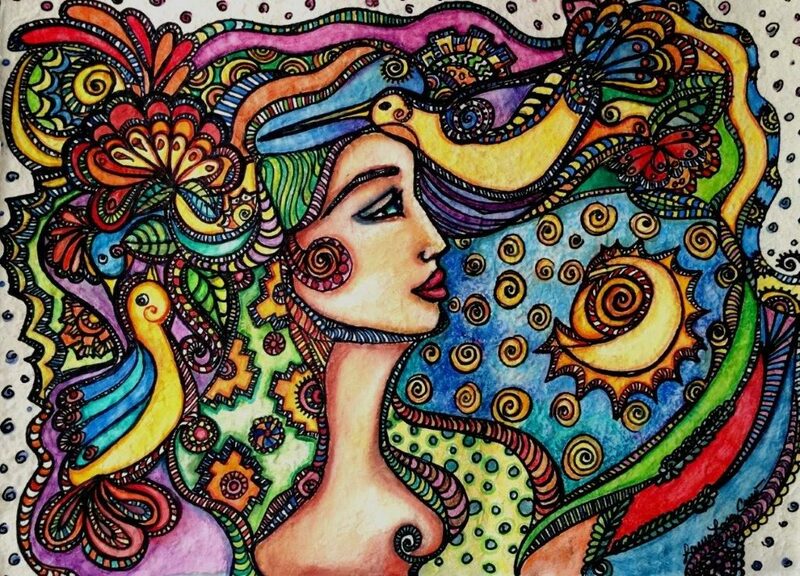 Laura López Cano, Mother Earth. In particular the mural’s banner “To Become Aware of Our History is to Become Aware of Our Singularity” highly resonates with LAN! to explore Latino art as American art. Therefore, Latino Art Now! has drawn on its observation and attention to the shifting contours of contemporary art: The new directions of Latino art; the local and national art infrastructure; the global networks and intersections between Latin American and Latino art; artist’s artivisms and social practices; digital interventions; the city as site and source; the queer geographies of Latino art; and the significance of art as an economic stimulus, among others, to explore Houston’s and the national contemporary art scene. It takes the perspective that Latino art is an evolving notion traversing multiple generations and varying historical and social contexts. In 2019, more than eighty museums, galleries, libraries, theaters, and cultural centers are participating in the Spring of Latino in Houston, Texas. One of the most visible features since February has been the articulation of the Greater Houston urban space as a Latino Art Now! gallery with a series of bulletins, eco and digital billboards visually illustrating the rich and wide variety of media styles, themes, and forms of this American art. This intervention has provided unparalleled exposure to the LAN! by featuring seventy-six artworks by fifty contemporary Houston-based artists. The University of Houston-Center for Mexican American Studies with IUPLR research staff and faculty members of the UH College of Technology are developing a permanent digital presence of the LAN! Houston by creating a virtual visual artist registry—Houston has more than 250 Hispanic and Latino/a/x visual artists—in addition to a portable 3-D digital board system entitled, “Latino cARTographies.” It will showcase Houston’s Latino visual culture by mapping public and private spaces of Latino art along with vodcasts of artists and their interpretations of works, virtual tours, and augmented reality features. These projects will be hosted by UH and will be available online. The goal with both is to document, preserve, educate, and engage the public about the contributions of Latino art to creative placemaking, transforming Houston communities and American art. Olga U. Herrera, Ph.D., is director of the Inter-University Program for Latino Research Washington Office. Pamela Anne Quiroz, Ph.D., is executive director of the Inter-University Program for Latino Research (IUPLR) and director of the Center for Mexican American Studies at the University of Houston where IUPLR is headquartered. To learn more about LAN! and their ongoing events please visit IUPLR | Latino Art Now! Follow LAN!’s latest news on Facebook and Twitter.